The breathtaking promise of the English countryside can lift even the heaviest spirits . . .
Who Wants to Marry a Doctor? Why is Zoe hiding beneath her bed? Liz didn't want to stay at her boss' house. After all, he's her best friend's father. But what should she do? She had no choice. She knew it might cause trouble...and there is a reason why the handsome billionaire Harrison WANTS it! Who Stole It Best? A Wedding Themed Cozy Mystery Story Her big day is fast approaching but a bride can't walk down the aisle without a dress. Who stole it, and why? Find out in this cozy mystery story by debut cozy mystery author Quinlyn Kelley. What Happened In Vienna, Jack? Ofc. Michael Simon struggles to solve a wave of killing. His Nephlimi blood cries out for justice. The only problem is the human world needs evidence. He cannot dispense justice in the way he likes. Zara Riddle moves to a new small town for her dream job, only to discover she's a witch. And her house is haunted. 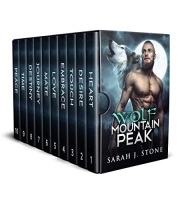 And her hunky next door neighbor is a wolf shifter. It's all fun and games until the ghost starts trying to electrocute her with a toaster! Haunted by a memory of the woman, left for dead, whose life he saved 20 years ago. Nolan Carmichael is getting a fresh start—new career, new company, new life. The only problem is, he liked his old life just fine . . . until an accident robbed him of his health, his job, his self-confidence, and his ability to go out in public without having anxiety attacks. To save Darien's life his brother asks, "Can you walk in high heels?" Troubled Aussie football star, Rhett Williams’ infamous off-field misdemeanours land him in front of his club’s board with an ultimatum: clean up his bad-boy image or lose his contract. There’s one catch: appear on a reality show to reinvent himself. Behind the waterfall waits 1796--and the girl who is slowly capturing his heart. But if Mark travels through time to save Susanna, will her brutal world trap him too? What Lexi wants is a simple life. What she gets is simply terrifying. A terrible misunderstanding separates high school sweethearts, Jo and Callum. When they meet again years later, will they be able to get past their hurt pride and old wounds, or will they go their separate ways permanently? A terrorist plot is underway. The FBI is several steps behind the terrorists. A journalist can’t find them either. The only one who knows what is about to happen is a Native American high school boy who saw it in a vision. Who will believe him? What can he do? Thank you so much for this awesome service, I've got loads of new reviews through your site :) ~ H.